Currently headquartered in Port Washington, Wisconsin, Allen Edmonds have been making boots in the United States since 1922 and when compared to other popular brands like Red Wing and Chippewa, they err more on the dressy side. 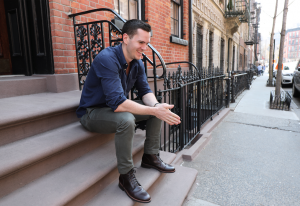 The versatile but you-could-probably-wear-them-with-slacks Higgins Mill boot is an iconic entry in the world of Goodyear welted footwear, as is their dress shoe the 5th Avenue. I’ve received a lot of requests to review more of their shoes and the Sullivan Street is one of their most striking boots. Let’s take a closer look. This look with the calfskin leather and the pebble grain on top is widely considered to be intended to duplicate the look of the Galway boot from Edward Green. Why would you want an imitation Galway boot? Because those boots are 1600 freaking dollars, so there are well over a thousand reasons you might consider doing with the Sullivan Street. Besides the very rich calfskin leather, of course the most striking feature is the pebble grain leather. Pebble grain is a bit of an anomaly in the world of leather. Embossed with a pattern that’s reminiscent of scales, it can be a little hard to pin down as far as formality goes because while this is a dressy boot, it’s not uncommon in cowboy boots or hiking boots. So you have to take the whole boot’s aesthetic into consideration. With a blue suit, I think these boots work well and it also hits the sweet spot of formality for a lot of office environments, although you could also pull them off with some nice dark jeans. This leather is called Coffee, and it also comes in black. It’s a really beautiful, lustrous calfskin leather that’s very high quality and goes by the name of vegano leather — not vegan leather (which, of course, is not leather) but vegano leather, which is an extra supple kind of calf. When I spoke with Allen Edmonds, they said the leather came from the world famous Horween Leather Company in Chicago and it’s actually dyed during the tanning process, which means the color is very unlikely to scratch off. The pebble grain is made from softy calf leather, a name given to particularly soft leather (how about that) and it’s also sometimes called scotch grain leather. One thing I like about pebble grain is that it’s really hard to notice scratches or discoloration and although it’s going to be covered by your pant legs most of the time you’re wearing them, it adds a sort of durability to the boot. Now, to keep this leather looking nice and supple and shiny, you want to use a cream polish like Venetian Shoe Cream or Saphir Renovateur every couple of months, depending on how often you wear them. That’s pretty much it for the calfskin, but I’d also recommend picking up a semi stiff brush because it’s really easy for polish to get stuck between the cracks in the pebble grain, so the brush can help to buff the polish out. There is a ton going on with this sole. Let’s start with the outsole. This is Dainite, very common in shoes at this price point and well known for being a solid compromise between form and function: it’s flexible, sleek, and it has decent traction in wet weather. It’s no Commando sole, but it strikes a nice balance. If you don’t like Dainite, you can actually pay extra for a single oak leather sole or a V-tread tap sole as well. It also has something interesting in the midsole called CustomCork, which Allen Edmonds told me is a mixture of cork and a certain kind of adhesive that responds to heat and pressure and absorbs the shape of your foot more readily than you regular cork midsole. Once you’ve been wearing the shoes for a while, your foot sinks into the footbed and it takes on a custom shape to your foot. There’s also a leather insole and a very thin layer of padding made with urethane between the cork and the insole. to provide some more support. This is also made with what they call a “bench welt” which is a type of welt that they put on their shoes that helps provide a more stable connection between the sole and the shoe itself. It uses a leather welt that wraps around the outline of the shoe and the stitching only goes through the welt: the upper and the sole aren’t attached to each other, but they’re both attached to the leather. 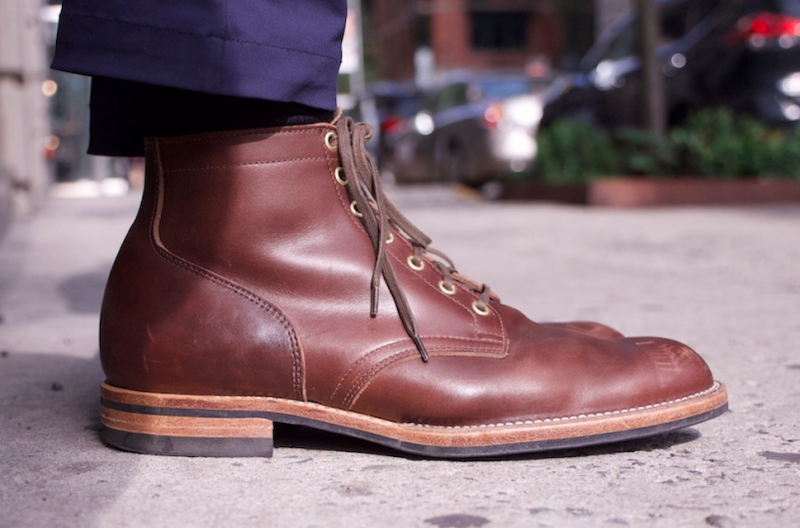 That sounds a lot like a Goodyear welt to me, but Allen Edmonds assures me it’s more stable and it seems to be more flexible than your average Goodyear welt. 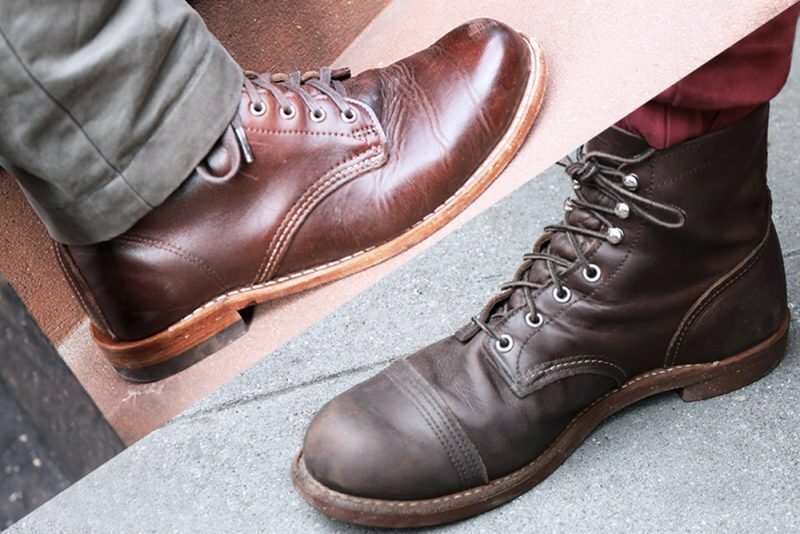 In any case, this method makes for a tight seal that’s super water resistant, but it also makes for a boot that’s easier to resole. These shoes run from sizes 6.5 to 15 in four widths: B, D, E, and EEE. They’re true to size, so I grabbed an 11.5. I would note that it seemed a teeny tiny bit big — it’s nothing I would complain about not would I consider returning them, it’s just that when it’s laced all the way up the shaft it closes completely around my leg and still wrinkles a little around the vamp. Not a big deal and hey, the soft leather is extremely soft, plus the boot is leather lined and I had no issues breaking them in. At full price, these shoes run $445 on their official site, but they’re often on sale for $377 and it’s not hard to get a 20 percent discount on Allen Edmonds. They often have discounts for first time buyers, but around the $400 to $450 mark is what you should expect to pay. So this is on the pricier side. It’s not quite Alden level expensive and it’s worth emphasizing that this isn’t made with your standard Chromexcel leather like the Alden Indy or the Higgins Mill. This leather is truly gorgeous and I think it’s worth more than the Higgins Mill, but there’s no getting around the fact that few people want to pay over $400 for a pair of boots. These are unusual boots, which means they won’t be for everybody. But I was really impressed with the quality control (especially after being disappointed with the Higgins Mill), I’m a big fan of the novel materials in the sole, and the calfskin is some of the nicest I’ve seen. I won’t pretend it’s well priced and it’s hardly versatile, but if you’re looking for a pair of eye catching boots for the office then I think they’re worth a wear. I recently went for these from Allen Edmonds website for $249 during a sale in a dark brown and for that price these are definitely worth it. I agree these are TTS and maybe smidgen on the tighter size. These are on the same last as the Dalton boot which I also have a pair of in shell. Compared to the Daltons, I much prefer the Sullivan Street in fit. I wear these are my office/conference boots now with thin socks to maintain TTS fit. These are very flexible which made break-in almost non-existent. The leather was very squeeky when I first started wearing them. Excellent comment! Yeah I need to give the Dalton a try, I’m trying to decide between them and the Normandy for the next AE boot.